As the trees present us with a wonderful display of Autumn colours it is time to go out to view and celebrate them. 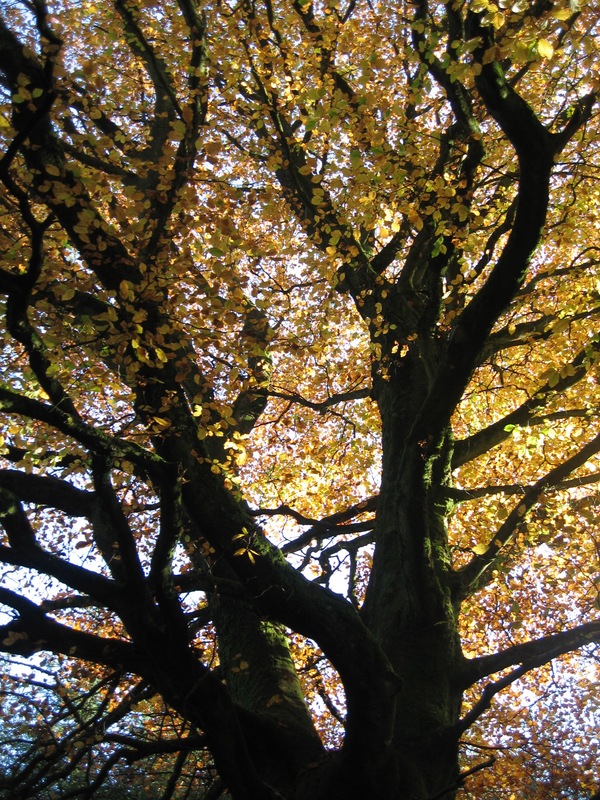 As the leaves fall we can see and marvel at the structure of each tree. Place your hands on the trunk of a tree and follow the tactile map of the bark to reveal its history. After exploring the structure place your back on the trunk and face out from the tree. Open up your senses to the world around you. You will see and experience the world from the trees’ viewpoint. Through the recent ‘Find a Tree’ exhibition, which I curated, it became clear that each of the ten artists who took part had developed a unique connection with their chosen tree or trees. It often led to some unexpected approaches in the representation of these trees. ‘Common Ground’, an arts and environmental charity, has explored and celebrated the different qualities of our landscape through artist-based community projects. One of these was the annual ‘Tree Dressing’ project where we were encouraged to decorate our favourite or special trees for the first weekend in December. This celebration of trees has historic and mythical connections in Britain, Europe and the world. When I worked as an art lecturer I often set this as a project for my students working on a large or small scale with local trees. Elaborate Tree Dressings require a great deal of planning and if the tree is in the public domain you will need to seek the necessary permissions. If you want to decorate a tree keep it simple. Make something from natural, bio-degradable, materials which will eventually disappear if you do not take it down. Small statements are just effective as the large ones. I make totems from sticks, wool and twine which are hung from the lower branches of trees in the garden and orchard. One of the most successful student projects I ran was the creation of small totem figures in clay which were placed in the nooks and crannies of trees. Be safe when putting your decorations on or in a tree and remember not to harm the tree or the creatures that have a close relationship with it. From small beginnings we can revive ‘Tree Dressing’ to celebrate and highlight the very special living beings that surround us.